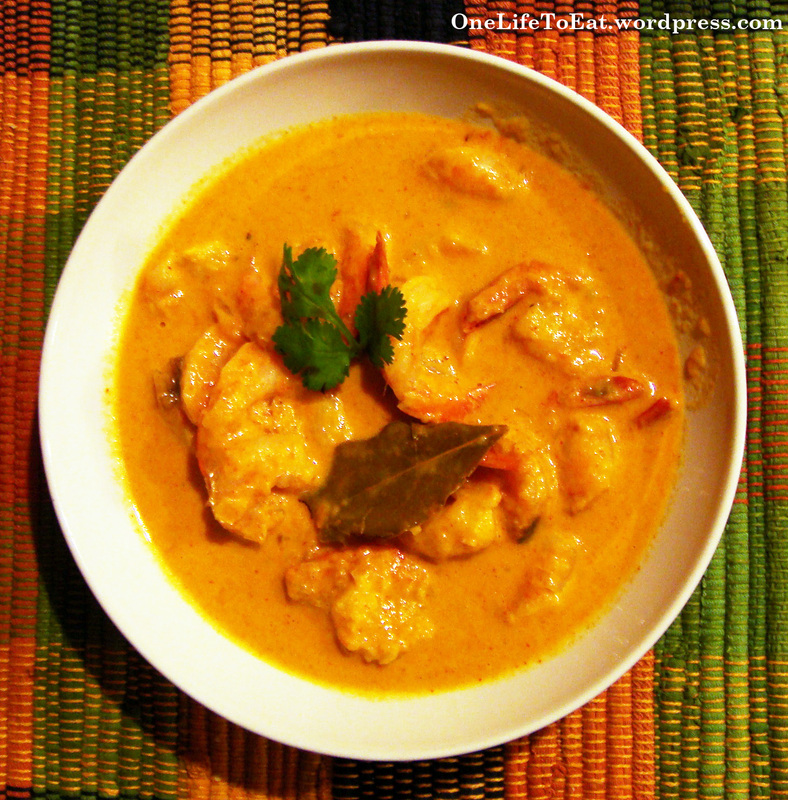 I put ‘Shrimp curry’ on my menu for this week – after I saw a packet of jumbo shrimp on sale at the grocery store – with no idea as to how I’d make it. After some trolling on the internet, looking for a good, spicy, indian-ish recipe (what mostly came up were thai-style curries), I came across one that was almost what I was looking for. Almost. Using this recipe as an inspiration, I’ve created my own version, to make it simpler to prepare, as well as to suit my taste and cooking style. When well heated, fry the roughly chopped onions on medium heat. Make sure not to brown the onions. Then add the chopped tomatoes with the tomato paste. The paste adds color to the curry. If you are using cooked shrimp, add it in the gravy just before serving, but do not let it simmer on heat. Turn off the heat and let the shrimp heat up in the curry itself. this looks fabulous, although I’ll have a hard time finding jumbo shrimp around here, I’ll have to use chicken instead. What should I use instead of ginger garlic paste? is it just crushed garlic and ginger? I actually have all the ingredients at home now. Hi Sarah! You can use the same recipe for chicken too! My suggestion – marinate the chicken in lots of lemon juice and some dry spices (chilli powder, cumin powder, coriander powder – 1/4 tbsp each) for about an hour. The dish is not meant to have pieces of ginger and garlic coming in your mouth while you eat, so try and grind some up – equal parts garlic and ginger. You can store it in a bottle for at least 3 mths so you can always use the rest in a later recipe. Good luck and do let me know how it turns out! Hi Kimkeen! Thanks for checking out OneLifeToEat! Read my reply above to Sarah’s comment. You can easily use chicken in place of the shrimp and it’ll be just fine. Do visit again! I tried the recipe and it tasted awesome. Thanks for sharing! Thanks for this recipe! Can’t wait try it. Like you, I was trolling the net teying to find something similar but could only find Thai dishes – until I saw your version. Yippee! I’m using both shrimp and chicken as I have a little of each. Cannot wait to make this, and thank you again for posting!! What vegetables go well with Coconut Shrimp Curry?